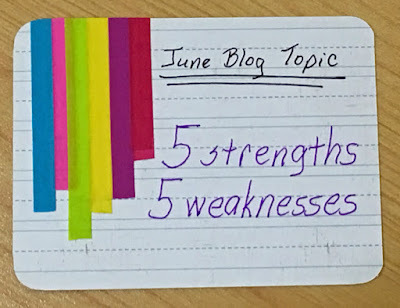 While I've pretty much kept up with reading the books my sister has sent me each month as part of our monthly book swap this year, I have gotten behind on writing about the blog topics she suggests. So, today's post is a little catch up. I think one of the reasons I got behind is because I just couldn't decide on my strengths and weaknesses. Every time I thought of something that is a strength, I realized at other times that same thing is a weakness. 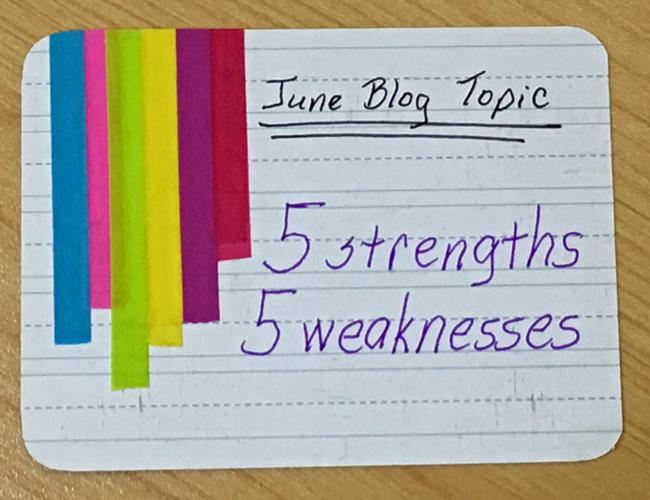 I've finally chosen five strengths to share, along with a note about how they might become weaknesses at times. 1. Organization - I'm pretty sure I was born organized! I actually enjoy organizing, whether it's preparing my weekly calendar, rearranging my scrapbooking stash, or straightening up the pantry. 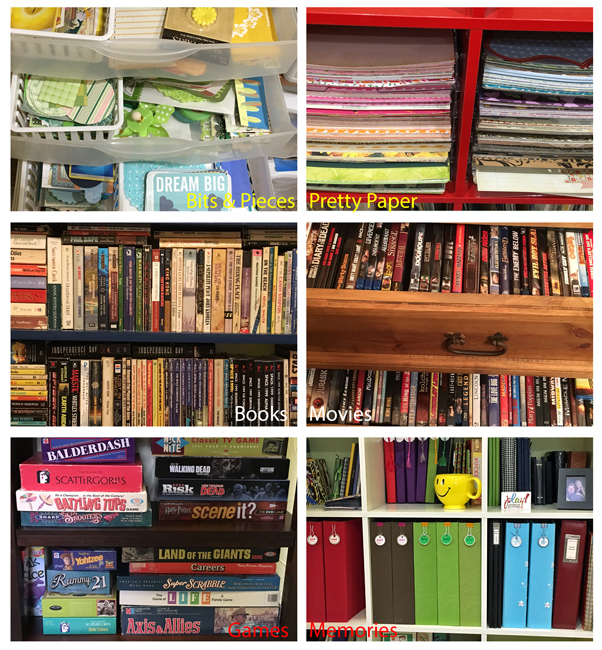 I can look at a pile of stuff or a random list of things to do and quickly figure a good way to organize, sort, prepare and get things in order. Of course, this need to be organized can be a weakness when it gets in the way of productivity. Color-coding my weekly to-do list is wonderful, as long as I follow through! And having everything in its place is nice, as long as keeping it that way doesn't mean I miss out on the important things in life. 2. Leadership - Anytime I take a test of skills or giftings, leadership is always one of the top three abilities on my results list. I don't have a problem taking charge, making decisions, working hard, or delegating tasks. I enjoy leading groups and coordinating members to work toward a common goal. Of course, I have to remember not to overstep any boundaries when someone else is in charge! 3. Teaching - Hopefully this one isn't a surprise to anyone. I love teaching, and, based on feedback from many individuals over the years, I'm pretty good at it. Honestly, I enjoy the whole process - preparing, studying, getting everything ready, the actual teaching & coaching & mentoring, building relationships with students & clients, etc. For me, teaching is so much FUN! This could become a weakness if I don't stop teaching at the point that the student is able to continue on his/her own, however, I really don't think this is an issue for me. 4. Creativity - Honestly, for most of my life I thought I wasn't very creative. In fact, I've often said I am the least creative person in my family. I think this is because much of my creativity comes out in the way I teach and organize and lead, however I have also always enjoyed scrapbooking and have tried a variety of creative endeavors throughout my life (like the ceramics class I took in junior high school and those homecoming corsages I created in my early 20s and the wallpaper I hung a few years later). 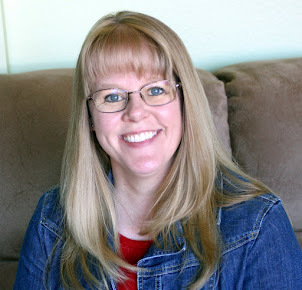 The past fifteen years or so, I have thoroughly immersed myself in scrapbooking, paper crafting, card making, illustrated Bible journaling, and a myriad of other creative pursuits. My creativity only becomes a weakness when I begin to once again question whether I truly am creative, thus hindering the INSPIRATION! 5. Faith - As a Christian, I have a firm foundation and moral standards that I strive to uphold. I know that I'm not perfect, but I have a Savior who died for my sins and continues to teach me and guide me in my everyday life. I know what I believe and am able to defend my beliefs through the truth of the Word. I can't image my life without Jesus. I want to live my life in such a loving way that it points others to Jesus, letting my actions speak louder than my words. This is probably my strongest characteristic, however it can come across as too strong at times. If I am not careful how they are expressed, my views can come across as judgment and condemning. What would you put on a list of your strengths and weaknesses?Would some items be classified as both? I was relieved to get this easy topic and am using photos to showcase some of my (and our) collections. 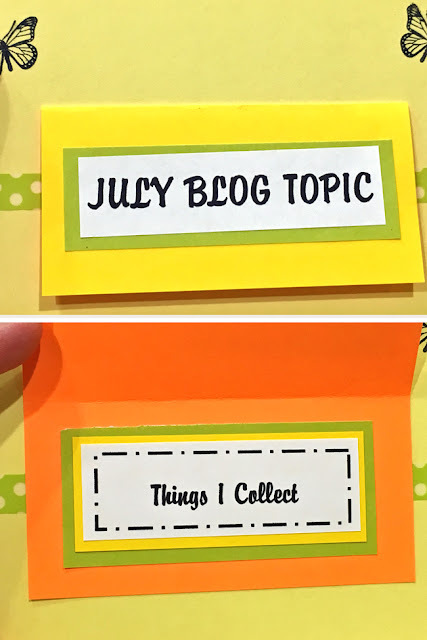 This month, we each sent the other a small book so we could get caught up - me with my blog topics and Brenda with her reading. 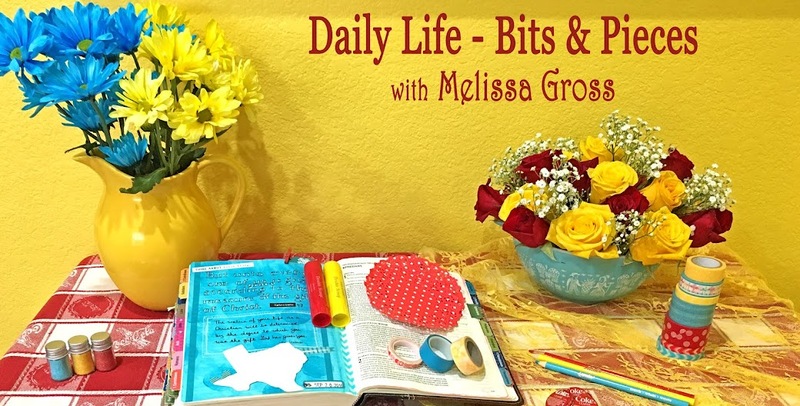 While she didn't send me a blog topic this month, the package I received was full of goodies for Bible journaling, scrapbooking and my One Little Word binder. I thoroughly enjoyed the small, easy-to-read book, Dream More by Dolly Parton. This book was based on Dolly's commencement speech to the University of Tennessee graduates a few years ago. 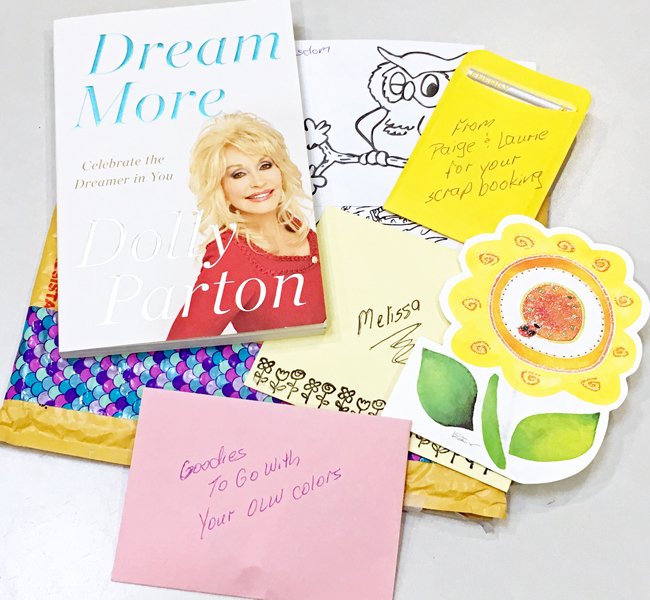 The message she shares is to (1) Dream More, (2) Learn More, (3) Care More, and (4) Be More. As she encourages us to embrace these four hopes, she shares her own stories of dreaming (to become a singer), learning (as a lifelong pursuit), caring (especially her efforts to give back to her community in rural Tennessee), and being more (with God as her foundation). A wonderfully uplifting read! I sent Brenda The Prayer of Jabez by Bruce Wilkinson. This small book is based on 1 Chronicles 4:10, a short prayer found in the midst of a long list of genealogies and is a great example and reminder of the effectiveness of prayer as "God granted (Jabez) that which he requested." Well, that catches me up! We're going to skip the book swap in September, but will start up again in October. From what I see of your strengths & skills on the blog, I would agree that you know yourself pretty well. I probably can name my weakness faster than my strengths - maybe I need to work on that.